After the U2 show in Miami Wednesday night, I spent Thursday relaxing in my fabulous suite in the fantastic Epic hotel. 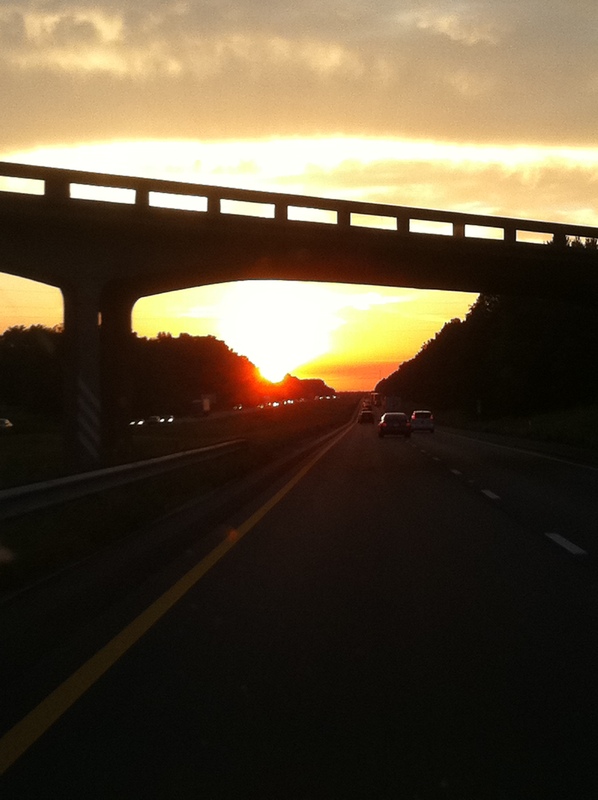 I left Miami at 6am est Friday morning and should have arrived in Nashville around 7pm cst. 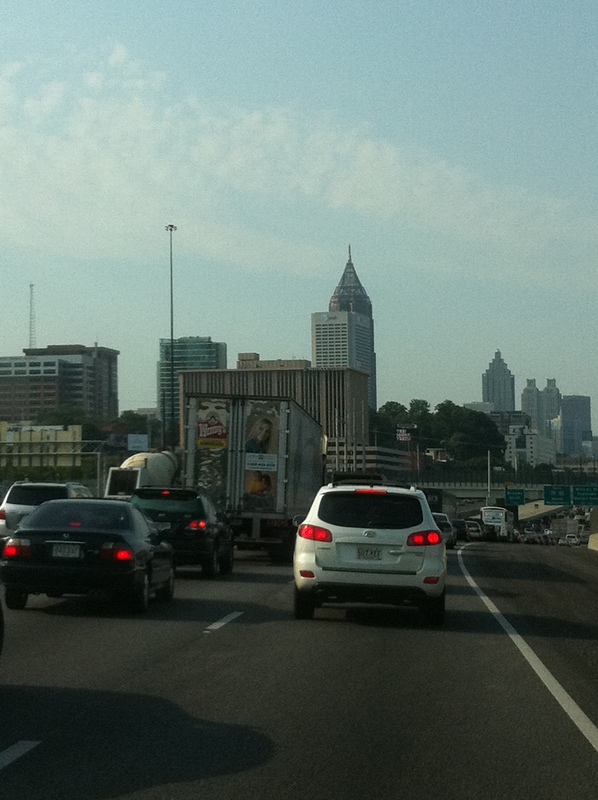 But because of horrible traffic around Atlanta, I didn’t make it to Nashville until 9pm. I was in the car 16 hours driving over 925 miles. I was exhausted. Elvis and Cilla were exhausted. 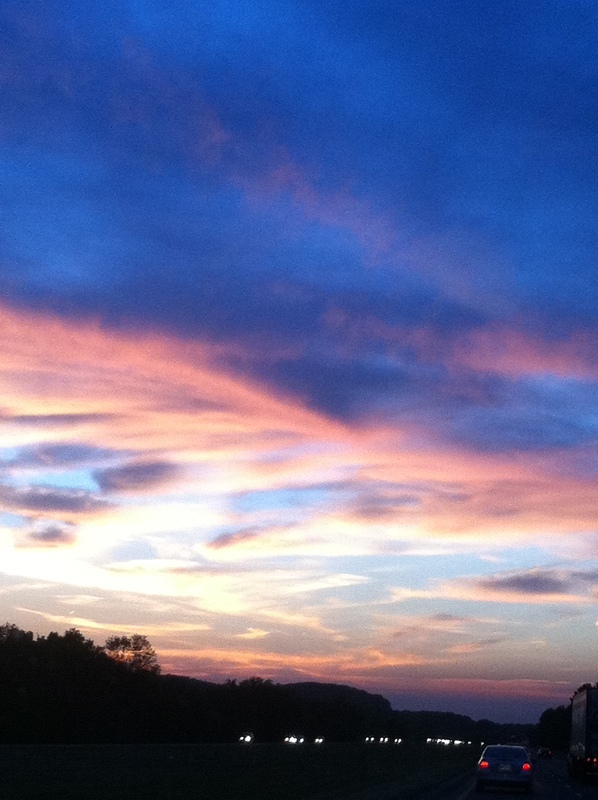 By the time I got checked in at the Hotel Indigo, unpacked and walked the dogs, it was after 10pm. 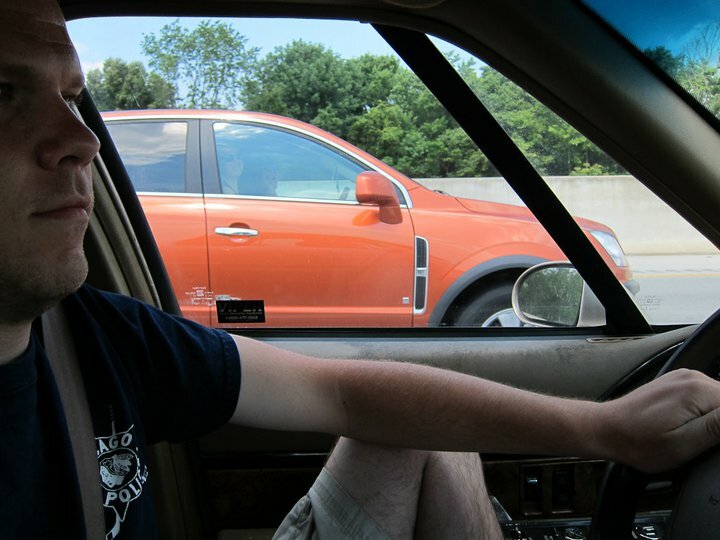 I should have known better than to try to make it from Miami to Nashville in one day, especially when that one day was the Friday of 4thof July weekend. 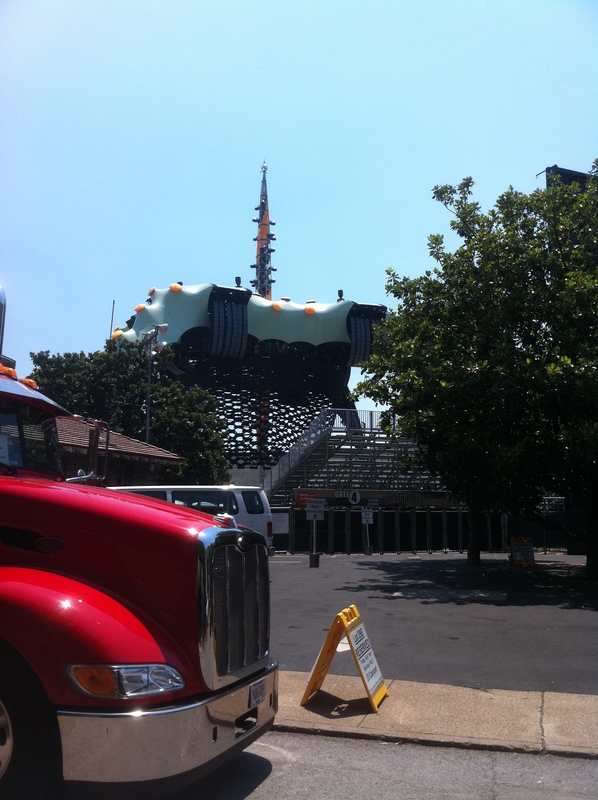 The U2 360 show in Nashville was fantastic, which was a nice reward for that long trafficy 16 hour drive from Miami the day before. 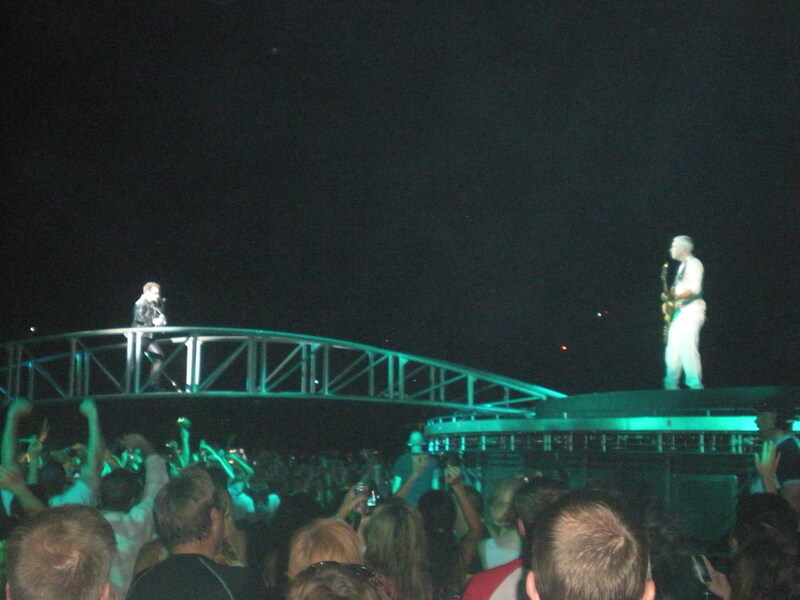 It was the 50th day on my U2 360 across America tour, my 10th show that leg of the tour, my 69th U2 show overall and the 100th show of the entire 360 tour. 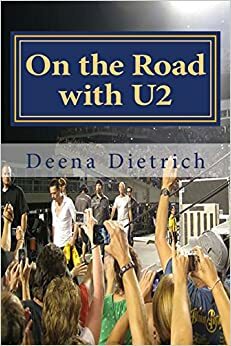 I had been really looking forward to the Nashville show not only because it was sort of my hometown show (3 hours from Memphis where I lived at the time), but also because U2 hadn’t played in Nashville since 1981. I wasn’t disappointed. 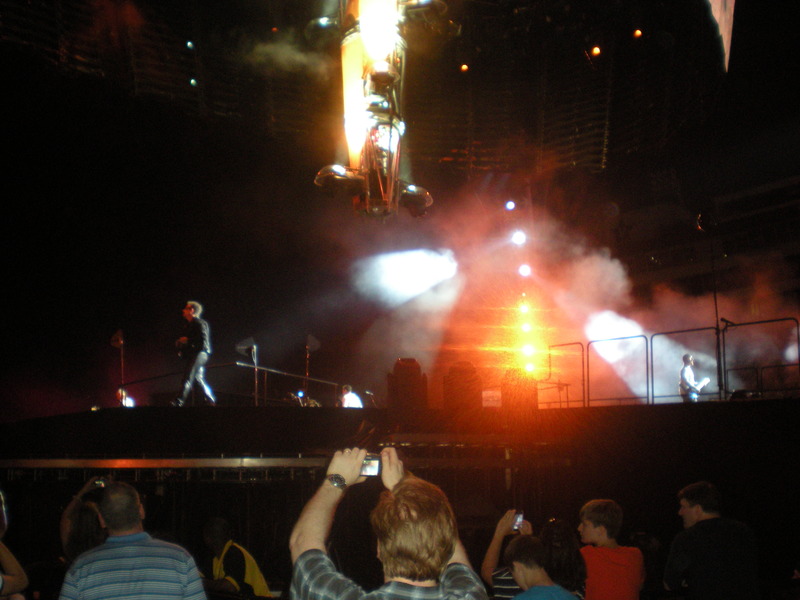 There were some great moments at that U2 360 show in Nashville. U2 played The Wanderer for the first time, honoring Johnny Cash. And after Moment of Surrender as U2 was walking off stage, Bono pulled a blind guy up on stage who played guitar while the band came back and played All I Want is You and then Bono gave him his green ‘goal is soul’ guitar. My friend Tasha flew in the morning of the U2 show in Nashville. 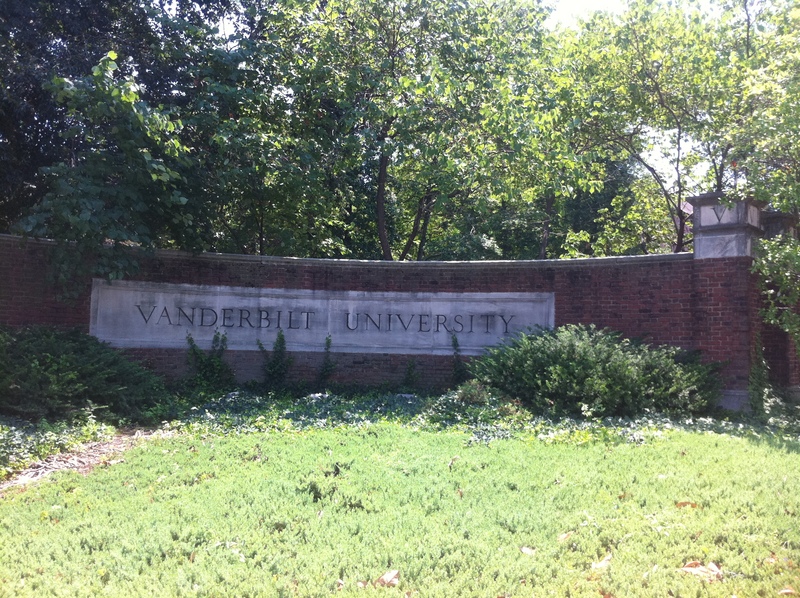 We relaxed in our hotel room in the morning, then had lunch at Blackstone on the way to Vanderbilt Stadium, which was about a 7 block walk. We arrived at the stadium and talked with old U2 friends and met new ones. 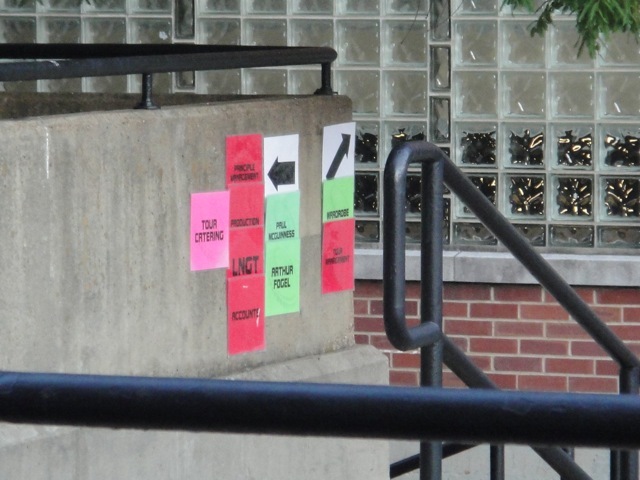 We immediately discovered where the band was going to enter – we saw the signs for the dressing rooms on the building attached to the stadium. Since it was hot and sunny, we decided to stand in the parking garage to wait for them. 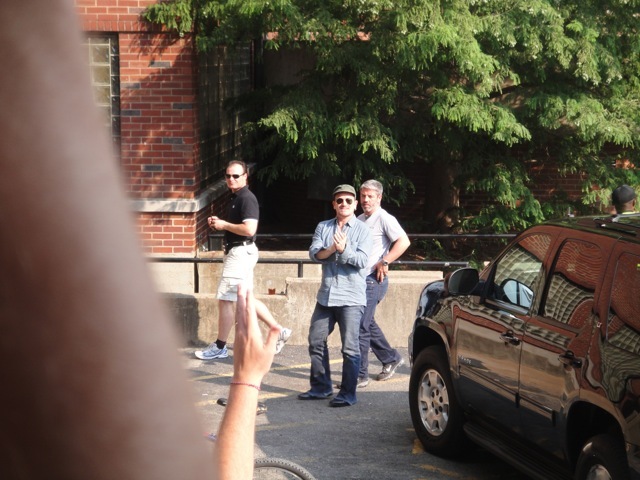 We had a great view of where U2 would get out of their cars and enter the building, or if they walked out to sign autographs and take pictures we could run down to meet them. After a couple hours, everyone figured out where we were and joined behind us. Edge arrived first, waited in the car a while, and then went into the building. We noticed that Edge’s car had a Shelby County license plate, which is Memphis. Then we saw Willie Williams give Edge’s security guy a Sun Studio tee shirt. Were U2 in Memphis visiting Sun Studio and Graceland without me? 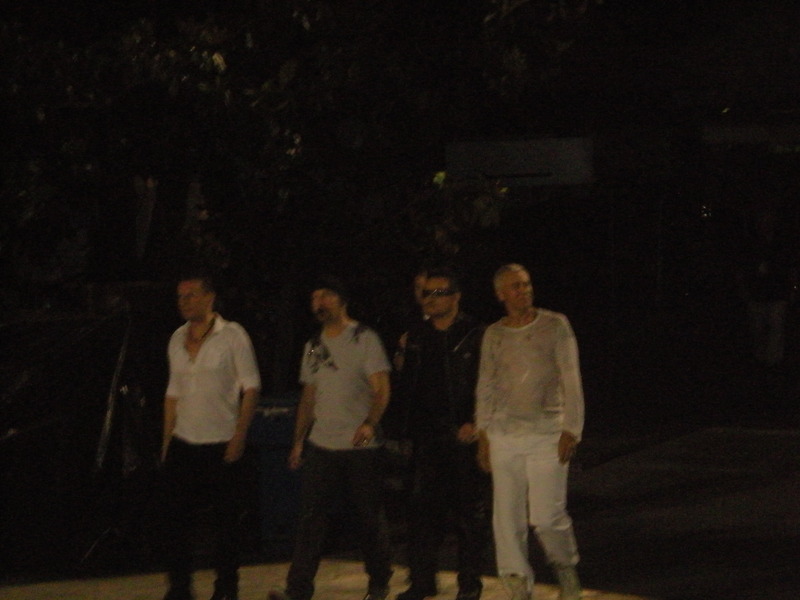 Bono arrived next and started to walk toward us, but Brian pulled him back saying they didn’t have time. Adam and Larry arrived at the same time. Adam got out of the car first and went into the building. 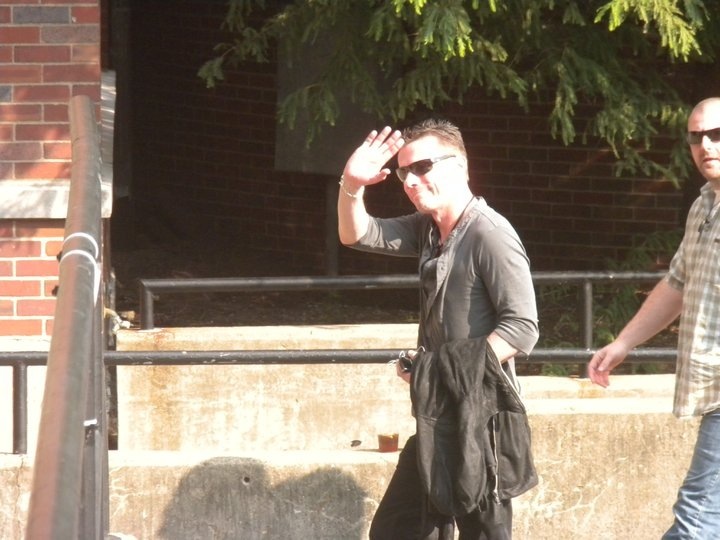 Larry then got out of his car and smiled and waved to the fans then went into the building. 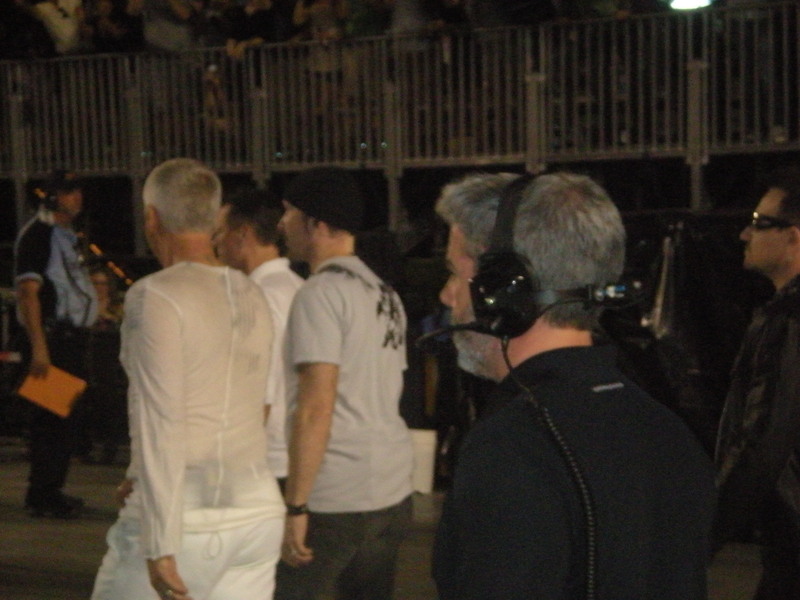 I didn’t get to speak to Larry, but this was the first time this tour I saw him arrive at the stadium and get out of his car and wave to us. 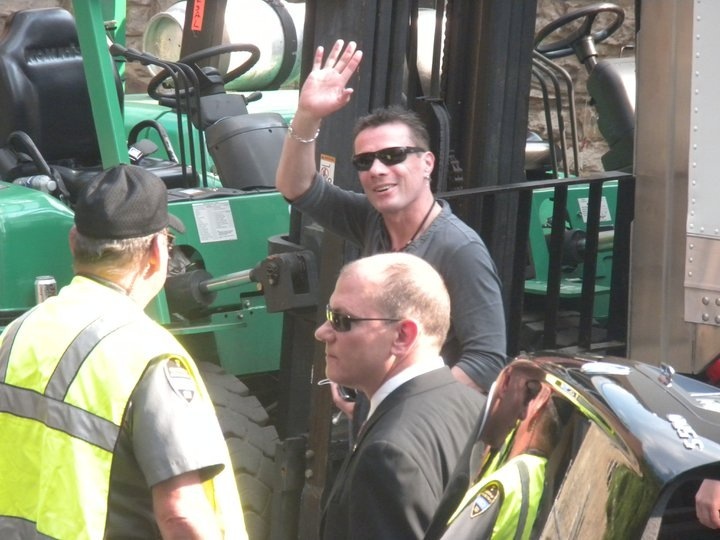 Please watch my video of U2 arriving at Vanderbilt stadium in Nashville. We easily made it into the inner circle, even though it was a small college stadium. 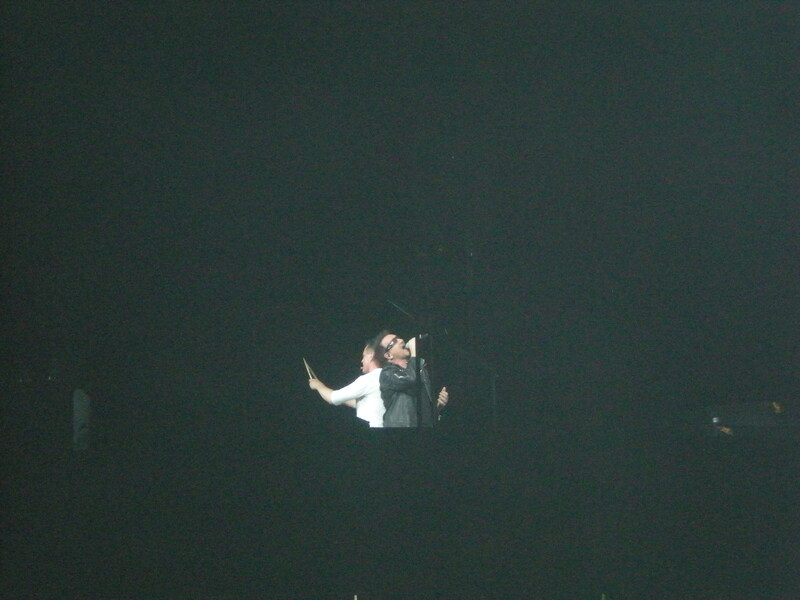 This was the last show Florence and the Machine opened, which was fine with me. 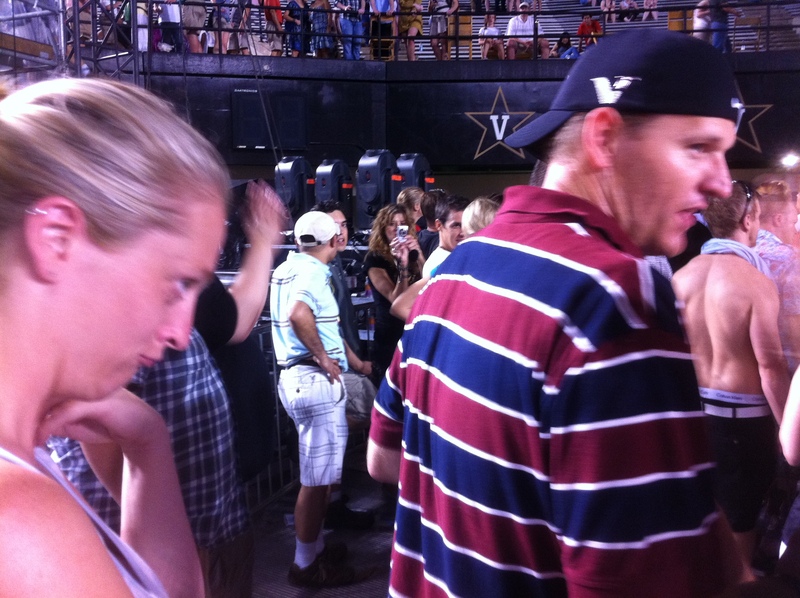 I watched the show in Nashville from Adam’s side of the stage because Tasha loves Adam. Also, U2 entered from Adam’s side of the stage, so for only the second time I didn’t watch U2 walk under the stage from Edge’s side. During Even Better Than the Real Thing, Bono said, “In a sea of songs, where you going to take us tonight Music City?” Before The Fly, Bono said, “Nashville, Tennessee! With love from Berlin 1991. The Fly,” And then again in the middle shouted “Achtung Y’all!” Bono pulled our friend Dan up on stage during I Will Follow – it was Dan’s birthday. There was a lot of echo during I Will Follow, which I don’t remember before. During the band introductions, Bono mentions that U2 hadn’t played Nashville since 1981 and then says his name is Bono and they are a band from Dublin, Ireland. Bono went on to say, “Behind me the man who gave us our first job and made us as a result unemployable for anything else. He’s a handsome man. He’s a thoughtful man. And he’s had that haircut since 1981. 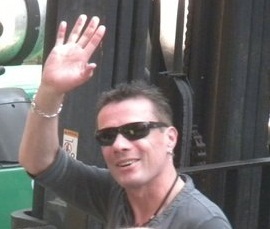 Larry Mullen on the drums.” Please watch my video of Bono’s band introductions. Before I Still Haven’t Found What I’m Looking For, Bono said, “In a city of masters, we’re students. We’ll stay students.” Later in the song, Bono said that their friend Cowboy Jack Clement was in the audience. Clement worked with Sam Phillips at Sun Studio in Memphis and recorded Elvis Presley, Johnny Cash, Jerry Lee Lewis and many others. Clement recorded U2 at Sun Studio for Rattle and Hum. Immediately following Still Haven’t Found, Bono started singing The Wanderer trying to imitate Johnny Cash’s voice. 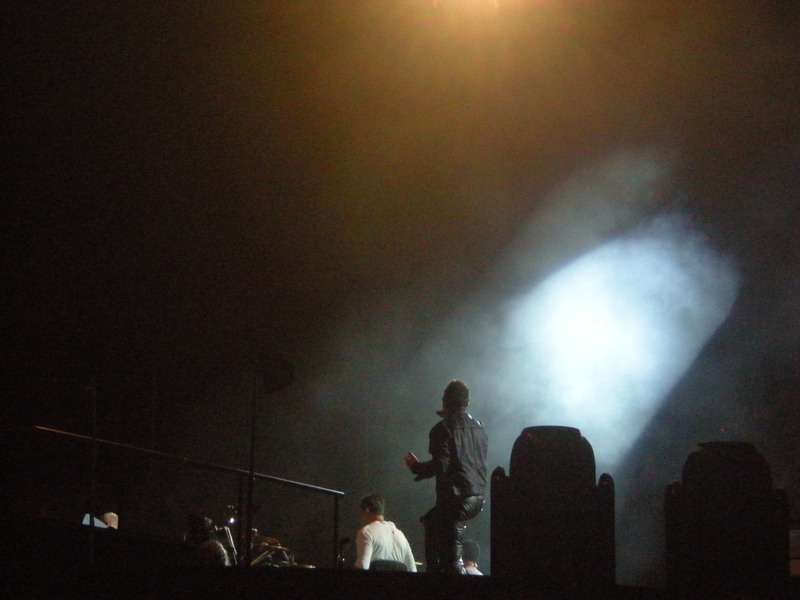 At the end, he said, “forgive us Johnny.” This was the first time The Wanderer had ever been played at a U2 concert. Please watch my video of The Wanderer. 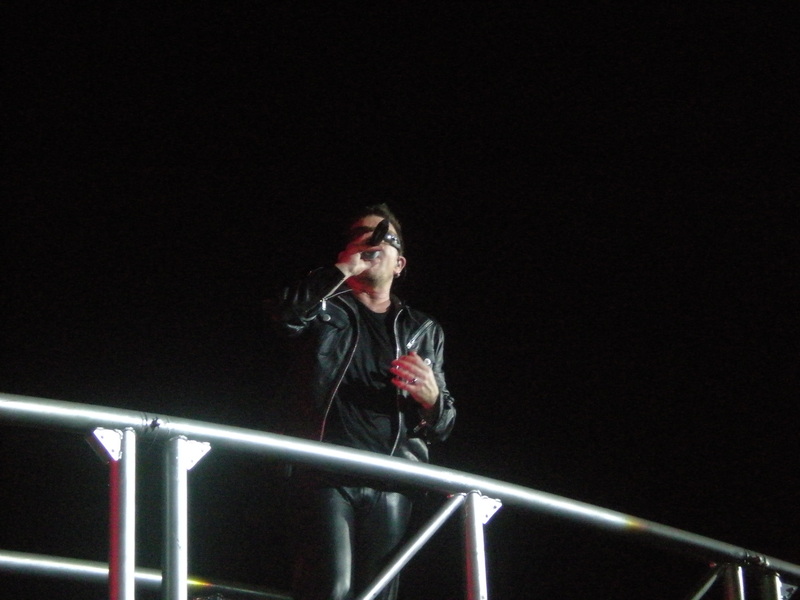 I heard the audience cheer for the first time when Bono sang, ‘a shout rings out in the MEMPHIS sky’ during Pride. 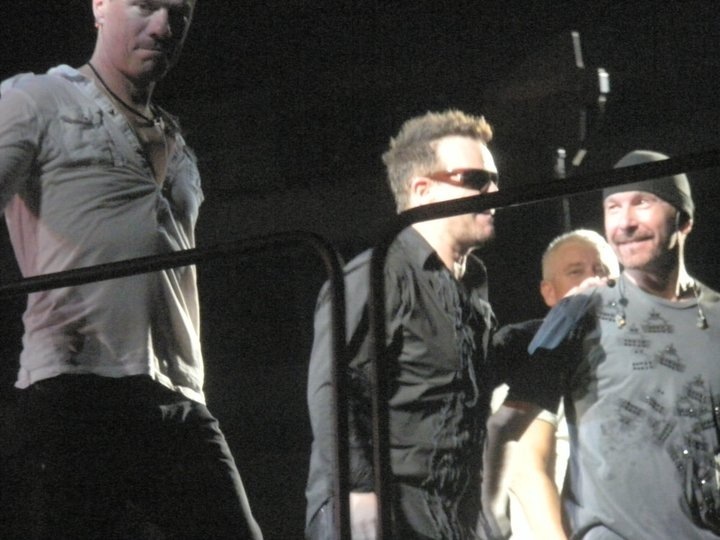 After Moment of Surrender, Edge, Larry and Adam were walking off stage when Bono announced they had a special guest. A guy appeared on stage and played guitar to All I Want is You while the rest of the band joined in. 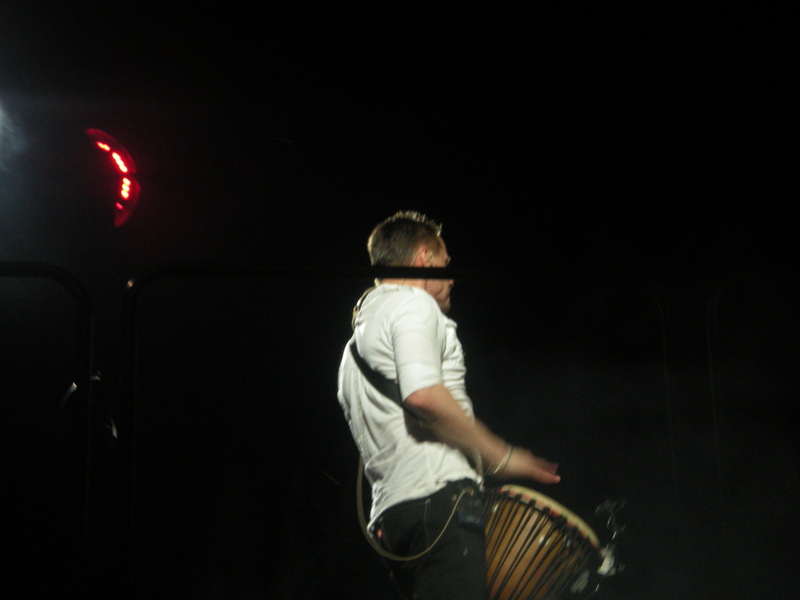 He dedicated the song to his wife and then Bono gave him his green ‘Goal is Soul’ guitar. Security was really annoying and wouldn’t let us stand to watch U2 walk out of the stadium, but we managed anyway. After screaming LARRY a few times, he finally turned to me and smiled and waved. As we were walking out of the stadium, we noticed the fan who was on stage playing All I Want is You was walking out right in front of us. He was blind, and he didn’t have the guitar with him. He said he had a sign saying something like ‘pull a blind man up on stage’ and they were mailing him the guitar. He also said he didn’t realize what was going on. He thought the concert was over and then Bono pulled him up on stage. I later realized he was the same guy who had been emailing me earlier that day looking for a GA ticket. Please watch my video with that fan, Adam, playing All I Want is You with U2. 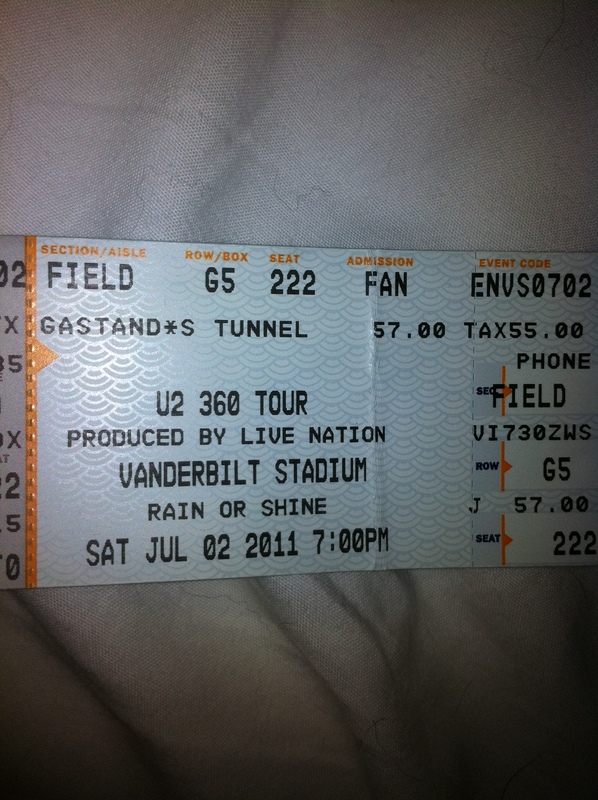 The U2 360 show in Nashville was a great show! It bumped Baltimore out of the spot for my second favorite show, and may even be better than Seattle – although Larry did shake my hand at the Seattle show. But in Nashville I saw Larry arrive and get out of the car and walk into the building, which I hadn’t seen Larry arrive at any of the previous 9 shows. We got two extra songs in Nashville – the first time playing of The Wanderer in memory of Johnny Cash, whom I love, and All I Want is You was played with a fan on stage who got to keep the guitar. 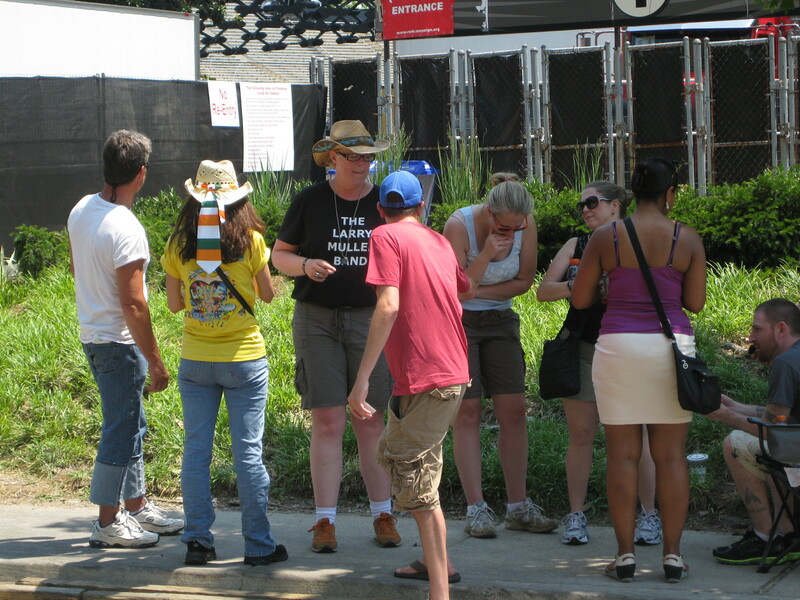 Also I got to hang out with a lot of my friends – Tasha, Chuck, Jennifer, Melissa, and others. I didn’t take many pictures, which is proof I was really into the show. It was hot though – hotter than Baltimore even. The set list for the Nashville 360 show was as follows: Even Better Than The Real Thing, The Fly, Mysterious Ways, Until the End of the World, I Will Follow, Get On Your Boots, I Still Haven’t Found What I’m Looking For / The Wanderer, Stay, Beautiful Day / Space Oddity, Elevation, Pride, Miss Sarajevo, Zooropa, City of Blinding Lights, Vertigo, I’ll Go Crazy / Discotheque / Psycho Killer / Life During Wartime, Sunday Bloody Sunday, Scarlet, Walk On – You’ll Never Walk Alone, One, Amazing Grace / Where the Streets Have No Name, Hold Me Thrill Me Kiss Me Kill Me, With or Without You, Moment of Surrender, All I Want Is You. 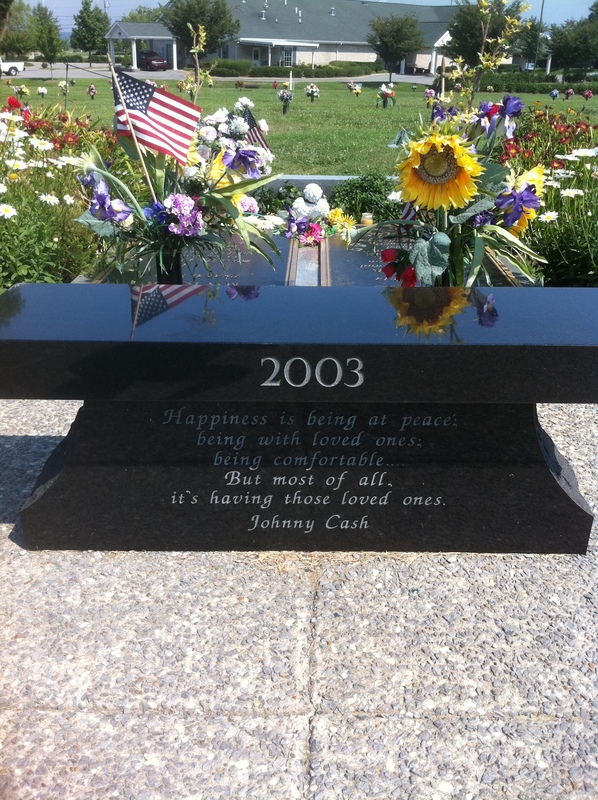 On Sunday, the morning after the U2 show in Nashville, we drove to Hendersonville about a half hour away to visit Johnny Cash’s grave. 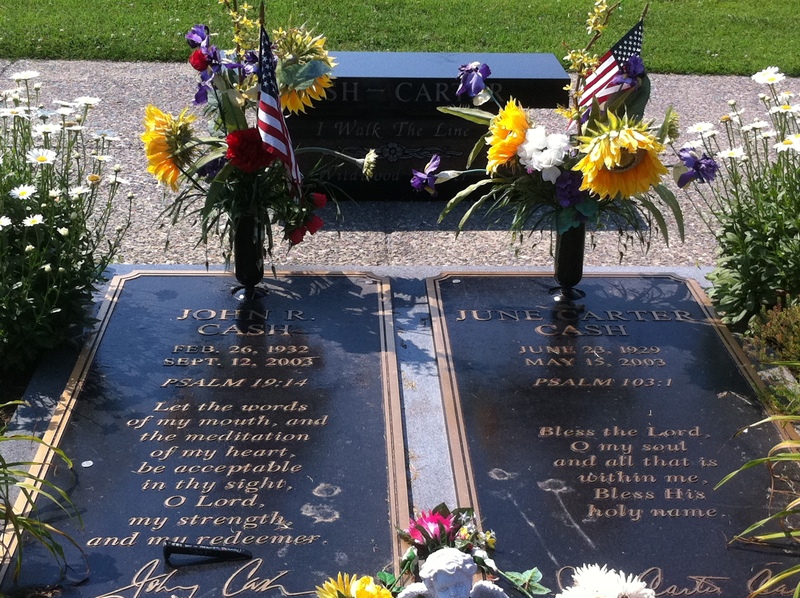 Tasha and I are both big Johnny Cash fans and had never been to his grave, even though I had lived in Memphis the past 3 years. After Hendersonville, we passed by the Corvette museum in Bowling Green, Kentucky and stopped at Abraham Lincoln’s birthplace in Kentucky before we made our way to Chicago for the U2 show Tuesday. 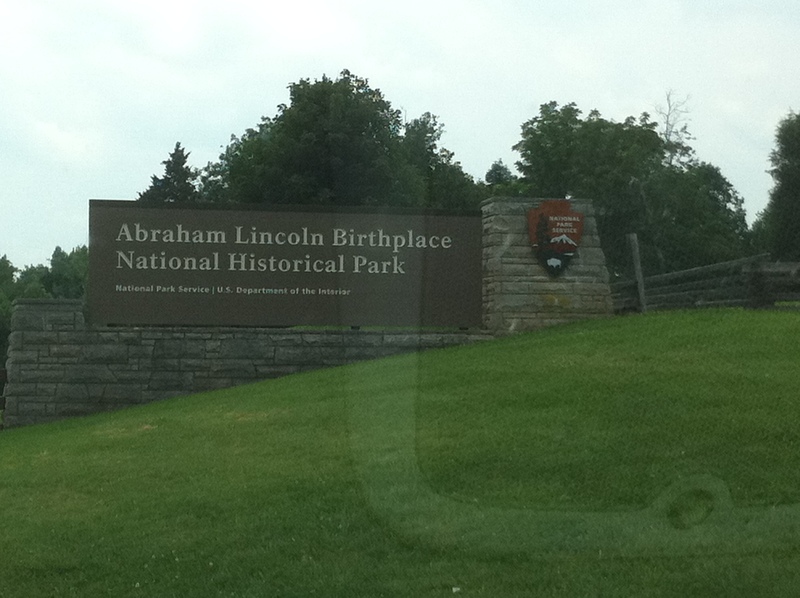 Abe Lincoln was born in Kentucky?